A precious fragment from the revival of sculpture in the European Middle Ages posits an image of racial harmony unusual for its time. Through a reworking of an ancient scheme of the cosmos, a fuller impression of the notion of blackness before the age of exploration comes into focus. Boldly carved twin figures of the constellation Gemini herald the power of the age to give concrete form to the positive role that race could play within the Western world. The figures are carved in bold relief on a fine-grained marble slab measuring just over 2 feet high. They are identified by a Latin inscription carved beside the left figure: Sol in geminis—that is, “The Sun in Gemini.” Several related fragments give an approximate idea of its original form and complexity. The Gemini slab is both slightly curved and finished on the back, suggesting a freestanding, circular structure such as a fountain or monumental pulpit. The reliefs all come from collections in and around the southern French town of Nimes. The area is well-known for its wealth of surviving monuments from the ancient Roman period and for the rise of great examples of ecclesiastical architecture during the 11th and 12th centuries. The style is termed Romanesque for the clear influence of Roman models on both buildings and sculpture of this period. 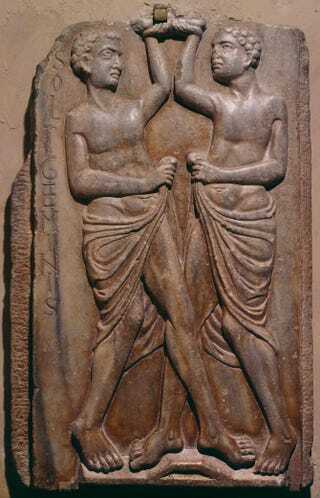 The figures on the Gemini relief represent the third constellation of the zodiac identified in antiquity as the divine twins Castor and Pollux. These intrepid travelers and horse tamers were born of a mortal woman, Leda, from separate fathers: one Zeus, the king of the gods, and the other Tyndareus, her husband and the ruler of Sparta. The extremely popular cult of the twins persisted into Christian times, when their role as divine intercessors was absorbed by similarly related pairs of saints. Cosmas and Damian, the bringers of physical health, and Peter and Paul, well traveled as evangelists, represent the new faith’s syncretic adoption of the twin heroes. In both their pagan and Christian interpretations, the twins epitomize a wide-ranging complementary relationship marked by the divergent natures existing within the essential bonds of kinship. For Zeno of Verona, writing in the fourth century, the twins represented the combined wisdom of the Old and New Testaments, in keeping with his spiritual interpretation of these pagan signs of the zodiac. Honorius of Autun, writing not long before this relief was carved, symbolically likened Adam and Eve, “made from one body,” to the sign of Gemini. A particularly impressive achievement of the artist is found in the sensitively rendered heads of the figures. The intention seems to have been to racially distinguish the twins. The facial traits of the figure on the right exhibit pronounced black features, while the aquiline nose of his companion is normative for a person of European origin. A clue to the meaning of the relief lies in the activity performed by the figures. Their raised arms support the lower edge of a short horizontal block, while the angled form on which their advancing legs are placed resembles a column base. Between these two conventional structures, the twins themselves serve as atlantes—that is, supporting elements in the form of human figures who bear the now missing frame of the relief. The inherent notion of support so originally achieved here may also allude to the celestial context of the sign, which “holds” the sun during the spring on its transit through the zodiac. Born of the same mother, the twins of different races reflect dual natures of the same entity, working harmoniously together. The medieval tendency to project a resolution of opposites seems here to evoke the universe held in a state of dynamic balance. The use of the black figure in medieval art was largely symbolic. Here it is positive, though in other cases, representation of the great cosmic struggle between good and evil likened demonic forces to the concept of darkness. Blacks were often represented as the torturers of Jesus or the saints in works of this period. In the Gemini relief, however, this pointed distinction between good and evil does not apply. Clearly another aspect of the black person is evoked in the twin on the right. His presence creates a singular, positive impression of harmony obtained through the complementarity of difference, rather than the implacable confrontation of hostile forces. The black twin does not appear again in Western art. The constructive role of the African figure in the greater scheme of things does occur during this period, however—once more in the context of astrology. It is within this realm of inquiry that the unbiased conception of the black in medieval culture seems most at home. The Gemini relief reveals an optimistic image of inclusion within the Western consciousness. Instead of the stigma of sin, the image of the black could literally be lifted to the heavens as part of an ideally ordered universe.